You think you know emoticons? Wikipedia has dozens and dozens of emoticons in their online listing. Everything from the common ones that we all know to obscure ones that you’ve probably never seen. They also have some interesting multi-line emoticons based on double-byte characters. If you haven’t seen this video of Taiwanese motorcyclists you are missing out. Best 3.11 minutes of the day, guaranteed. Bill Watterson was a teacher. He taught us to look at the world as children again, and he taught us about the silliness in our ways as adults. 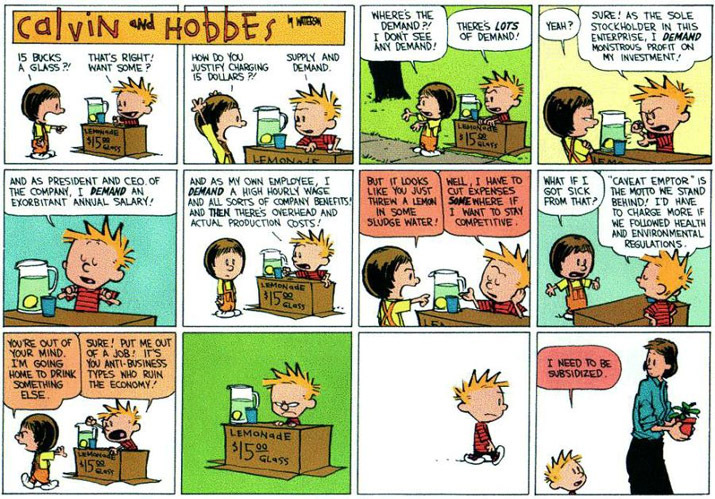 One of my favorite strips is, oddly enough, a sad commentary on our economic dilemma. It is astounding how much insight he was able to package into just a few small boxes. I am one of the luckiest people on the planet. Not because I win things. Can’t remember even winning a raffle. And I’m not rich, at least by US standards; you’d probably call me middle-class. My lifestyle isn’t extravagant, and my tastes are pretty simple. Given the billions of people on the planet, however, I’m wealthier and healthier than the vast majority. I’m really lucky. And here’s the thing: I don’t need any more stuff. I don’t need a bigger TV. I don’t need more horsepower, better handling, or more fun out of driving. I don’t need more channels on cable. I don’t need greater internet bandwidth. I don’t need a faster CPU, a bigger hard drive, or more music selection. I don’t need a bigger house, nor do I need more space to put things. I don’t need more clothes. I don’t need more food (unlike most of the people on Earth). But this post really isn’t about me as a person. It’s a post about the US economy. And it’s actually an optimistic post, once you finish. Bear with me. There are plenty of the people in the US (and the world) who would like (need) more stuff. A lot of these people are struggling to survive, and they would probably prefer to have food more than any of the other items. Unfortunately, these people don’t have a decent chance at improving their situation right now. They don’t have good job prospects. There used to be jobs around making stuff. But these jobs have gone overseas, to people who have even less stuff than we do. Some of these jobs might come back, but only because we learn to make things more cheaply (i.e. lower wages), or because we raise the quality high enough to become competitive. So what does this mean for us as a country? And what does it say about the future of our economy? To me, it means that it is time to do something different. For the past sixty years or so, the US has had an economy about making things for people like me to buy. Now, when everyone is “waiting for the economy to recover”, I can’t help but wonder why they expect it to come back. Things have changed. There is very little that I could purchase that would substantially improve my quality of life, and I’m part of the dwindling middle class that has disposable income for stuff. What are you going to sell to me now? To me, this means we need a shift in focus. A shift to quality; a shift to improving what we have, how we do it, and who we are. We need a shift away from “let’s all get more stuff” to a land of “better organized” and “more efficient”. Better communities. Better schools. Better relationships. Let’s be better people. Let’s have less wasted water, food, fuel, etc. The list isn’t hard to expand. Now this is not an easy change. Even worse, the short-term impact on the economy might actually be negative. Many companies are successful precisely because there is waste in the system. But we all will benefit from the results in the long-term. And no, this isn’t about cutting corporate profits. It’s about changing the nature of those profits. We can’t turn this ship on a dime, but we can turn it. And turn it we must, if we hope to have anything worthwhile to pass on to future generations. So please join me in saying “Not more, not bigger: Better, and more efficient.” There is enough room there for all of us to keep busy. No more stuff for me, thanks. Well, at least their Lego counterparts will. Glad to see, at the end of the day, and despite all the technology, we’re still very human at heart. World Got you Down? Read This. Here’s a great list of 50 things you can feel good about right now. Yes, there are tons of negative things happening right now. But there’s tons of good things too. You get to choose your focus.